Happy Monday! All things love today, friends.... here we go! 1- Who is your oldest friend? How did you meet? My oldest friend that I still keep in contact with is my friend Adia from high school. She was in my high school classes all the way until the end, all seven years! We aren't in touch as often as we should be but when we chat, it's like we never left off. 2- Who are your people? I have a few people but we are tight! Okay scratch few people. Through this post, I'm realising that I have a lot of peeps! 3- How did you meet your partner? In TGIF's in Chaguanas in TNT. It was 2002 and we became friends and then it quickly developed into soulmate status!! 4- What's your love language? I wrote a whole post about it but it's words of affirmation firstly for sure. 6- What's the most meaningful gift you've ever received? That's a tough one but recently my friend Kamini gave me a gift basket for my birthday with so many of my favourite things (she read a post of mine). It had chocolates, wine, a jade roller, a diffuser with a sampling of oils, my fave chocolate pecan pie which she just about searched the town to find, a framed picture of us and some teas with a steeper. Oh and she paid for my makeup to be done the night of the party. It was so kind and so thoughtful! 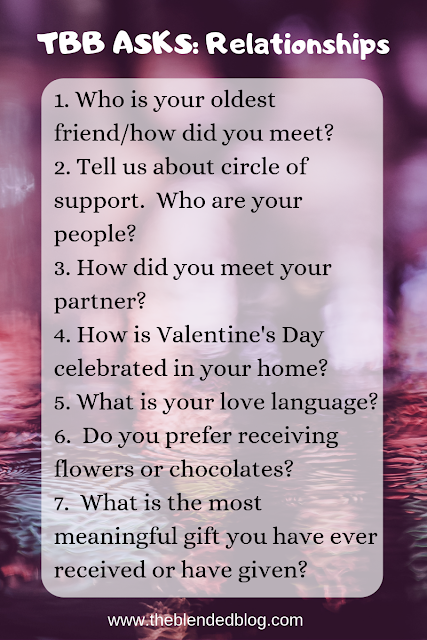 7- How is Valentines' Day celebrated in your home? 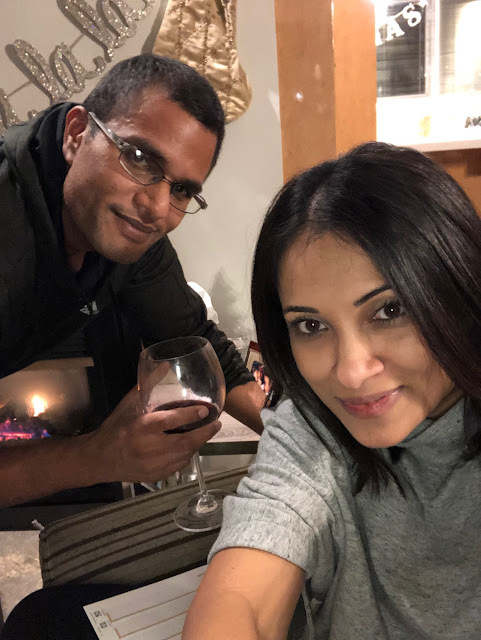 For the past couple Valentines' days, we have ordered in from a nice gourmet take out place in town, opened some bubbly, used our wedding china and crystal and enjoyed a multiple course meal with the kids. Lots of fun and I believe we are doing it this year again! How about you? How do you celebrate Valentine's Day? I love that you enjoy multiple course meal in with the kids for Valentines! I hope you have a marvelous Monday! That sounds like a perfect Valentine's Day dinner! You and your hubby are such a cute couple! That birthday present sounds amazing! I love how your family plays such a huge role in being your people. Thanks for linking up! Awww....love "Soulmate Status"! And yes you have lots of people!! Love how you celebrate Valentine's Day!! Thanks for linking up with TBB!! I love that you include your kids and get out the china so fun. And Yes to having lots of people in your corner, it takes a village right? I like your style re Valentine's Dinner!! And what a sweet gift your friend gave you! Valentines with your kids sounds really cool. Id prop do the same. Fancy Take out at home where your comfy is always good! Look at all of those photos of your fabulous peeps. I, too, thought I didn't have a wide circle of friends until I started thinking about them all. Family always comes first, though. My love language is words of affirmation, too. I don't care for gifts at all, I just need that verbal praise and support and demonstration of love. I love that you use your china on Valentine's Day. I just may have to do that myself. Having met my husband in grade school and now homeschooling my boys I am always so curious as to how/where other couples meet! Aw, that is such a sweet gift from your friend. I love gifts like that. And I like the sound of your Valentine's Day plans!! !